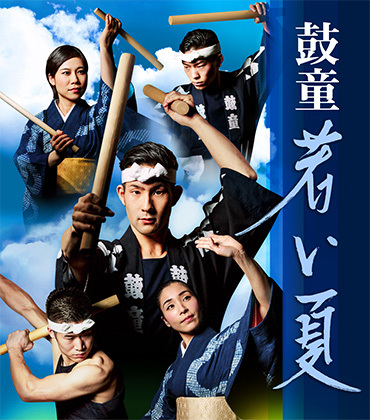 Kodo’s new production “MEGURU” is on tour in Japan right now! 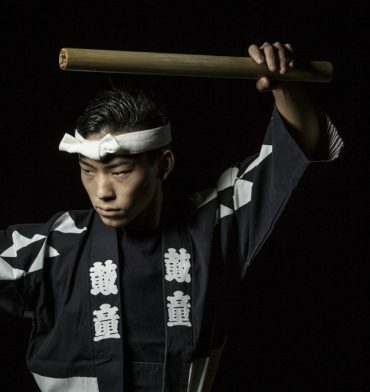 The director, Yuta Sumiyoshi, became a Kodo member not long before I did, so I am really interested to see how this work is received by all of you throughout Japan! Meanwhile, I’m currently on tour giving Workshop Performances at schools throughout Japan. These concerts are mainly held as an opportunity for students to appreciate performing arts. Our performances at schools differ from our theater performances in many ways. For one, there isn’t such a clear boundary between the stage and the audience in a gymnasium, and for two, we don’t have lighting to set the scene. The biggest difference is the audience. At theaters, the audience is made up of people who are interested in our performance and paid to come along, but at schools, the audience is all children who are there as part of their lessons, with different feelings about being there. 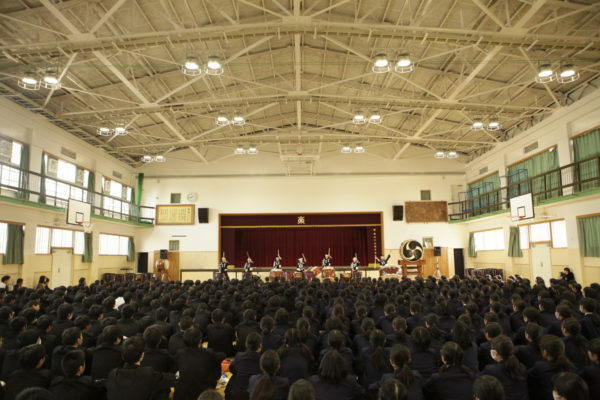 I think the taiko concerts we give at schools are meaningful for various reasons. 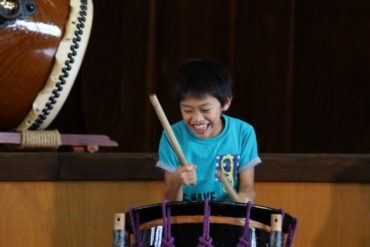 Firstly, they provide an opportunity for children today to learn find out about a traditional Japanese instrument. Secondly, the performances give children a chance to see people who have thrown themselves into doing something they love and pursued it as a career, which gives them an opportunity to consider their own future paths. And for us, it’s an opportunity for new people to hear about Kodo. These days, we can find out about anything we are interested in by searching online, but the downside to that is that if we don’t search for something, we don’t find out about it so easily. Also, we can watch and listen to anything we like on TV or online, so we tend to be easily satisfied by just watching screens. No matter whether it’s acting, performing, or online shopping, seeing something via a screen and watching something live or in person is completely different. I think that is particularly true for Japanese drums. No matter how good a surround system is, it simply can’t recreate nor convey the echo of live taiko resonating in your body. 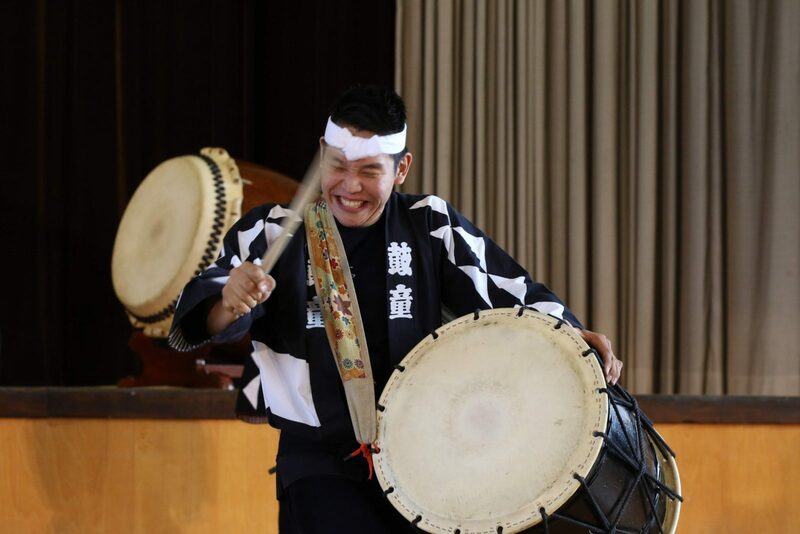 That’s why we travel to schools to meet children, who wonder “What’s Kodo?” and “Is ‘taiko’ a festival?”, so they can see taiko firsthand and listen to it live. I think that is a really meaningful thing to do! 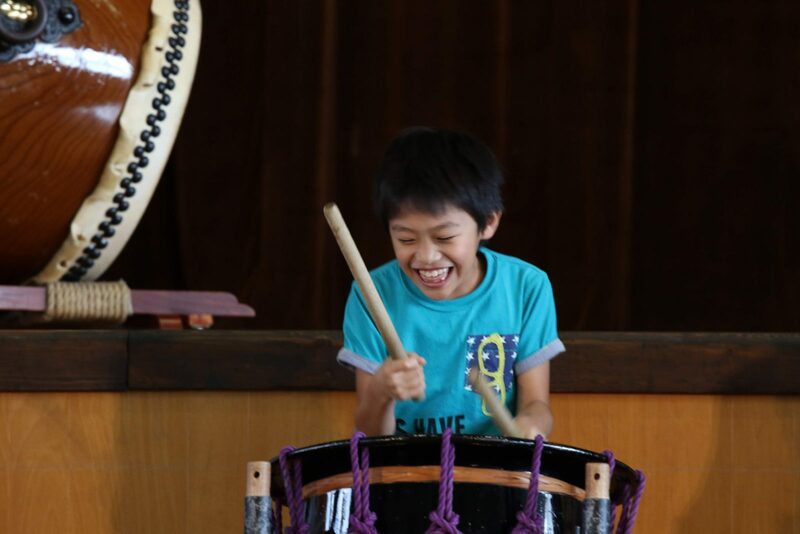 If the children who listen to our performance take an interest in taiko or our group, then I am really happy. We are constantly striving to make each programme and performance better than ever. We always have that challenge on our minds. But it doesn’t matter if we do something great or we do something bad if no one is interested enough to come and see what we’re doing. If no one is there to watch, we don’t know if something is good or bad. So, we tour and perform all over Japan in the hopes of connecting with even one new person each day, hoping they be interested in what we do and want to see us again. To our blog readers, I hope you’ll come and see Kodo perform, too! Each performance has a unique feel, so please come and enjoy yourself. I also encourage you to share your feedback and impressions with us afterwards. OK, it’s a new day and another performance awaits! Summer is on its way and I can feel the change of season in the air already. The other day I went to Asakusa in Tokyo with Tsuyoshi. It was a holiday so Kaminari-mon Street was bustling with many tourists. 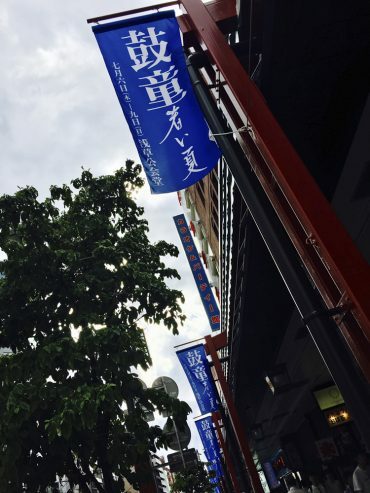 When we glanced up, we saw that Asakusa had put “Kodo Spirited Summer” flags up all over the place! 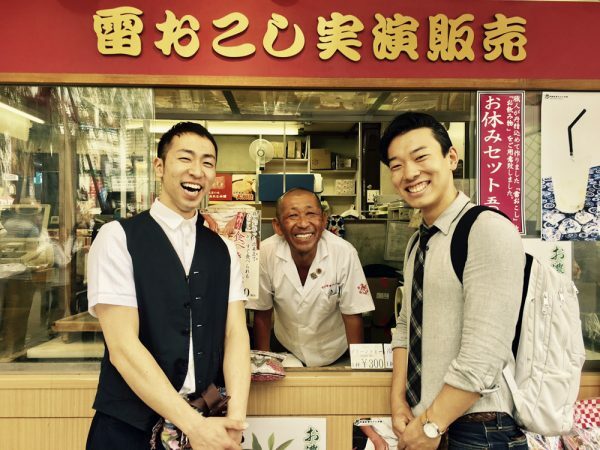 Tsuyoshi and I visited many shops in Asakusa to say hello to the local supporters of our annual Asakusa concerts. Unfortunately, we found that many of the people we wanted to say hello to were not at work on this particular day, so we had to leave messages for them instead. 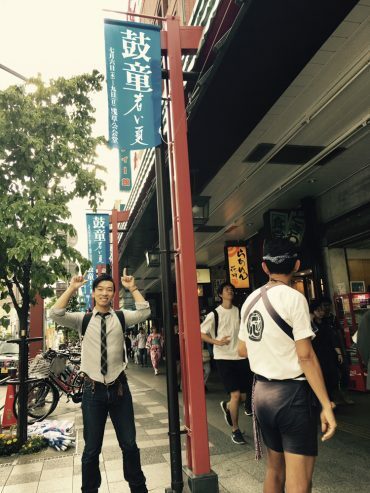 We were pleased to see Mr. Hokari, the owner of Kaminari Okoshi Honpo! This year marks the fifth year that Kodo has held back-to-back concerts in Asakusa. 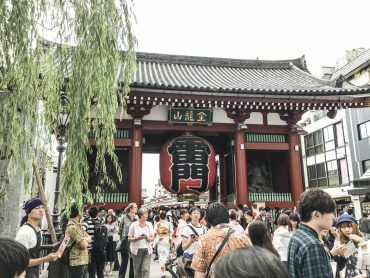 Every year the people of Asakusa help and support us in so many ways. Thanks to them, Asakusa is a very special place for all of us. 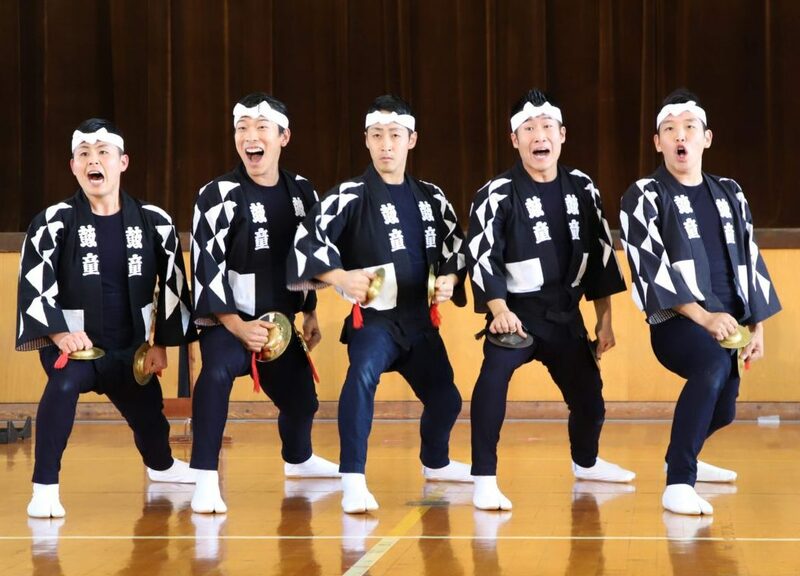 Our “Spirited Summer” tour begins on July 2 in Kyoto and will visit eleven cities throughout Japan. We will give performances in Asakusa from July 6 through 9. There are still tickets available, so please come along! After the humid rainy season, everyone needs a boost. We hope you will join us in July for our invigorating “Spirited Summe” performances! See you soon!